Welcome to Cottage Magpie, one of many stops on the spectacular 2007 Virtual Holiday Home Tour organized by the amazingly talented Tracey from Notes From A Cottage Industry. I hope that after you visit my home, you'll make a point to visit everyone else on the tour. I usually stick with my standard colors of gold, cream and aqua for the holidays, but this year I felt and urge to go for the cheery red-and-white. My son and husband are so cheery and full of joy, and they don't really "feel" my normally restrained color palette, so decorating the family room with the traditional red really made them happy. Since I didn't have many ornaments in that color palette, I had to improvise and create several ornaments based on thrift-store finds. In our previous home, we had a built-in buffet in the dining room that held our entire Christmas village. In the new house, the best spot was the built-in desk in the family room, which only had room for a few houses. I think it's just as charming, and when you look at it with the window behind, you can almost believe that it's life-sized. It's also at my son's height, so he has been having fun building Thomas train tracks to run around the village. 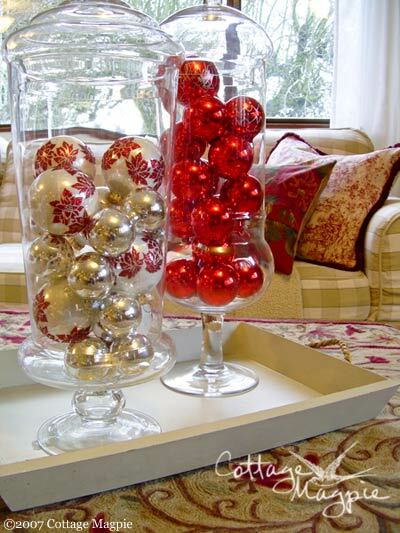 I used fabric from my stash to make red-based pillow covers to decorate the couch, and as a finishing touch, filled two discount-store apothecary jars with thrift-store ornaments in red and silver. The jars aren't really very "family friendly," so I put them away when my son is at home, but for those few quiet moments when he is at school, I put them out and enjoy them. I hope you've enjoyed the holiday tour of my home this year. 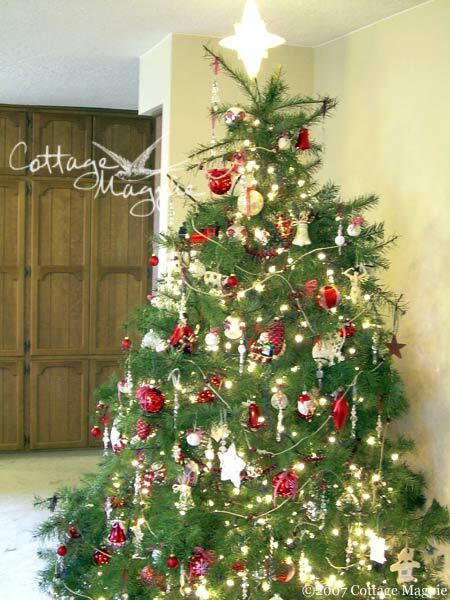 If you haven't already, I hope you'll take time to visit the rest of the homes on the 2007 Virtual Holiday Home Tour organized by the amazingly talented Tracey from Notes From A Cottage Industry.